In July 1999, the Commonwealth of Massachusetts and the US Army Corps of Engineers funded ENSR, a private consulting company, to carry out a nutrient TMDL study of the Assabet. A TMDL study is designed to assess how much pollution a water body can assimilate without exceeding state water quality standards. In 1999 and 2000, ENSR conducted intensive field sampling of the river to better define the river's eutrophication problem. The data collected was then used by ENSR to develop a watershed and water quality model of the Assabet River using the HSPF v10 application. After calibration and validation, the model was used to evaluate multiple future growth and remediation scenarios varying point and non-point source inputs. 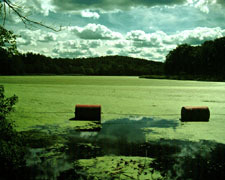 In 2004, the Massachusetts Department of Environmental Protection (MassDEP) issued the final TMDL report (Report Number: MA82B-01-2004-01) concluding that the Assabet is "nutrient-saturated" and that significant decreases in the concentrations of nutrients in the river would be needed to improve water quality. The findings confirm that the majority of the nutrients entering the river come from the publicly-operated wastewater treatment works (POTWs) that discharge treated effluent to the river. In particular, treatment plants are the major source of ortho-phosphorus (the bioavailable form of phosphorus) throughout the year. Non-point sources (such as stormwater, and sediment) also contribute nutrients, but contribute significantly less, than the point sources over the growing season. The principal non-point source during the growing season, the report concludes, is phosphorus flux from the sediments. Westborough, Marlborough, Hudson, Maynard. Adapted from ENSR 2001. "Phase 1 will establish POTW effluent total phosphorus limits of 0.1 mg/l at all major POTWs discharging to the Assabet River and allow the communities sufficient time to fund and implement a detailed evaluation of impoundment sediment as a potential alternative to lower permit limits. DEP believes that some sediment and/or dam removal options will allow the Assabet River to achieve water quality standards faster and, possibly, be more cost effective, than establishing lower POTW total phosphorus limits and waiting for the system to respond over time. Requirements will be incorporated into the NPDES permits to be developed and issued in 2004. Phase 1 will require that all POTWs be upgraded to achieve 0.1 mg/l of effluent phosphorus by April 2009 and the design should be consistent with adding new technology in the future to achieve further reductions if deemed necessary. Based upon the modeling results current permitted flows will be allowed. However, any request to increase a discharge beyond currently permitted volumes would require supporting documentation satisfying DEP's Antidegradation Policy that no other feasible alternative exists including, but not limited to, the discharge of additional treated effluent to groundwater to help restore tributary flows. Phosphorus limits will be seasonal. DEP and EPA will jointly develop an implementation strategy in the Spring of 2008 to decide if, when, and to what level additional upgrades will be needed based upon the results and recommendations of the sediment evaluation. Phase 2 limitations will be established in permits to be reissued in 2009 if sediment remediation, based upon the results of the sediment/dam evaluation, is not pursued, and/or new phosphorus criteria that may be developed in the interim by DEP and USEPA are applicable. If the communities choose to pursue sediment remediation alternatives, a revised schedule and work plan will be negotiated in the summer and fall of 2008. If the communities choose not to pursue sediment remediation alternatives they will be required to complete phase 2 improvements during the second 5-year permit cycle and begin operating by April 2013 and achieve the new limits by April 2014. In the interim, prior to facility upgrades in 2009, the POTWs will be required to continue optimization of seasonal removal of total phosphorus in their effluents to meet the 2000 interim NPDES permit limits for total phosphorus of 0.75 mg/l. Long-term monitoring of the Assabet River is essential to determine the efficacy of the adaptive management controls as they are implemented, to determine whether water quality standards have been achieved, or if additional source controls will be required. EPA and DEP will develop a detailed monitoring plan prior to implementation of Phase 1 upgrades. The agencies or their agents will implement the plan with assistance from the Assabet communities to evaluate and document water quality improvements and environmental indicators after POTW upgrades are completed during Phase 1. This TMDL can be achieved through the continued cooperation, effort, and oversight of federal, state and municipal agencies along with the watershed stakeholders." As of 2012, all four municipal wastewater treatment plants that discharge to the Assabet River completed upgrades to meet the total phosphorus effluent limits set out in Phase 1.